This activity is specifically designed for the students of governmental and experimental schools, aged between 12 to 16 years old. 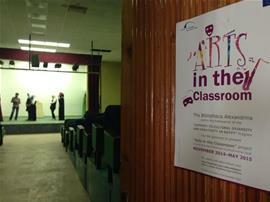 It aims to expose them to the arts and, accordingly, to enhance their artistic talents and social skills. This is to be done by providing them interactive sessions and workshops on four types of arts: fine arts, music, theatre and filmmaking. Each workshop extends over a period of four days, and as a whole, they are carried out in 12 different Egyptian governorate. 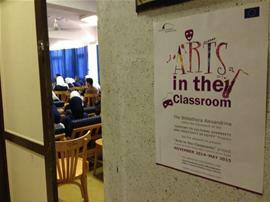 Essentially, “Arts in the Classroom” seeks to achieve important and varied goals. On the individual level, the program aims to raise the student’s learning capacity, which in turn will affect the students’ progress in their classes. Given the imagination, memory, communication, and observation exercises that it includes, the program also aims to help students to develop their talents and raise their skills. It also allows students to achieve personal notability, since it enables them to express themselves through a creative medium that others deem impressive. Furthermore, by giving them the opportunity to communicate with their colleagues and teachers outside the traditional and competitive environment of the classroom, the program also encourages students to enhance their communication skills and to build their team-spirit. From a broader perspective, the project will also benefit society as a whole. For the most part, exposing students to the creative experience and acknowledging the arts as a key element in their lives, will breed a generation who is able to present unconventional and creative solutions to the problems they may encounter in the different aspects of life. Given the link between awareness and culture, the program also works towards raising the students’ awareness and elevating their feelings. This, in effect, will breed a generation far from ignorance, extremism and violence, and henceforth; a moderate and peaceful society. Alexandria, El-Beheira, Damietta, Matrouh, the New Valley, the Red Sea, Al-Fayoum, Dakahlia (city of Mansoura), Ismailia, Luxor, Minya, Aswan (the area of Al-Nouba). Nominating 40 students from the three school-years of the preparatory stage, taken into account that there should be a balance between the number of boys and girls. Dividing the selected students into 4 groups (10 students at each group), taking into account the proportion of the number of the boys to that of the girls, and the number of the students from each school year. Each group will be specialized in one of the four arts (fine arts, music, filmmaking or theatre).Regarding the selection process, students are selected and divided according to their talents and their distinctiveness in the fields of specialization, if there is a previous experience which indicate that. 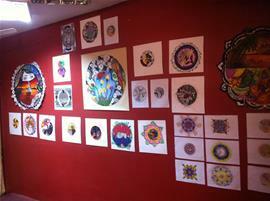 The student’s own desire to participate and to learn a particular type of art is also taken into consideration. Nominating four teachers from the school to oversee the events and activities of the project. One teacher is assigned to each group/specialization, preferably with one with an experience in the area of specialization, or at least an interest in the field. Providing suitable places for the four training workshops, each to accommodate 10 students, their mentor and assisting teacher throughout the four school days. Providing a big place to accommodate 40 students, the four mentors and four teachers, for one hour daily. The training period lasts for four days, each starting from 10:00 a.m. to 1:30 p.m. It is extended to an hour daily that is allotted to conduct a meeting between the teachers and mentors only. An orientation session given by one of the mentors, each to introduce the form of art they are working on. The session is attended by all participants including students, teachers and other mentors (each session lasts for 30 minutes). An open discussion on the same type of art with the mentor. The discussion is also attended by all participants and lasts for 30 minutes. This is followed by a 15 minutes break, after which the four groups are divided and each is assembled at their training locations, in such a way that each group is composed of 10 students, a mentor and a teacher. The groups start working for 2 hours and 15 minutes, intermitted by a 15 minutes break. Each training day concludes with a quick assessment of the productions of the day, in order to determine the areas of strengths and weaknesses of the produced work. The assessment acts as a feedback that helps to emphasize the strengths of the artworks and to avoid the weaknesses through the days that follow. After completing the training day with the students, an hour is allotted for knowledge transfer, as the mentor and the assisting teacher sit together and the former shares his/her expertise regarding the form of art they are both working on. In this light, throughout the workshop, each student covers 8 hours of practical training with the mentor on one type of art, in addition to covering 4 hours of theoretical and scientific information about the four types of arts. On the other hand, each teacher covers 8 hours of overseeing practical training, 4 hours of interaction and knowledge transfer with the mentor, and 4 hours of theoretical knowledge regarding the four types of arts. By the end of four days, one hour is cut out from the final training day to showcase all the artworks that each group produced throughout the workshop, and is attended by all participants. Furthermore, talented students will also be encouraged to participate in further events and activities. The project team will also select three students and a teacher from each governorate to attend the concluding conference of the program Support to Cultural Diversity and Creativity in Egypt at the Bibliotheca Alexandrina. Students will be selected according to their talents and interaction with the mentors, while the teachers will be selected according to their interaction with the students and the mentors. 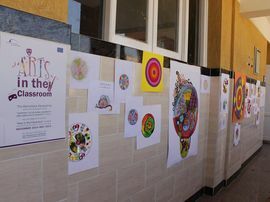 Within the framework of the program Support to Cultural Diversity and Creativity in Egypt, the Bibliotheca Alexandrina organized the twelfth workshop under the theme of “Arts in the Classroom” in Matrouh governorate, in the period between the 21st to the 24 of April, 2015. The workshop was held at the branch of the Exploratory Centres and Cities of Science and Technology in Marsa Matrouh. Within the framework of the program Support to Cultural Diversity and Creativity in Egypt , the Bibliotheca Alexandrina organized the eleventh workshop under the theme of “Arts in the Classroom” in the Red Sea governorate; in the city of Hurghada. The workshop took place in the period between the 14th to the 16th of April 2015, and was held at Hamed Gouhar Language School. Within the framework of the program Support to Cultural Diversity and Creativity in Egypt , the Bibliotheca Alexandrina organized the ninth workshop under the theme of “Arts in the Classroom” in Al-Wady Al-Gadid governorate (New Valley), in the period between the 16th to the 19th of March, 2015. The workshop was held at the branch of the Exploratory Centres and Cities of Science and Technology in Al-Kharga Oasis. 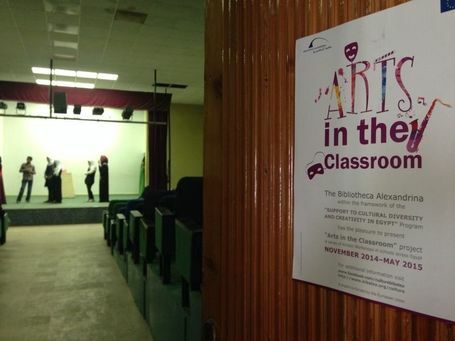 Within the framework of the program Support to Cultural Diversity and Creativity in Egypt, the Bibliotheca Alexandrina organized the seventh workshop under the theme of “Arts in the Classroom” in Mansoura, in the period between the 9th to the 12th of March, 2015. 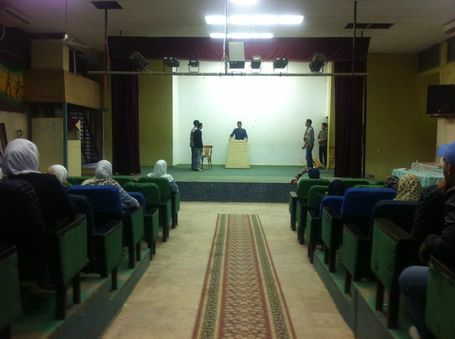 The workshop was held at El-Ferdous Experimental Comprehensive Language School. Fifty-seven students and eight teachers participated in the event. Within the framework of the program Support to Cultural Diversity and Creativity in Egypt, the Bibliotheca Alexandrina organized the seventh workshop under the theme of “Arts in the Classroom” in Ismailia, in the period between the 2nd to the 5th of March, 2015. The workshop was held at the 24th of October Experimental School. Fifty-four students and five teachers participated in the event. Within the framework of the program Support to Cultural Diversity and Creativity in Egypt, the Bibliotheca Alexandrina organized the sixth workshop under the theme of “Arts in the Classroom” in Minya, in the period between the 16th to the 19th of February, 2015. The workshop was held at the Minya branch of the Exploratory Centres and Cities of Science and Technology. Within the framework of the program Support to Cultural Diversity and Creativity in Egypt, the Bibliotheca Alexandrina organized the fifth workshop under the theme of “Arts in the Classroom” in Luxor, in the period between the 2nd to the 5th of February, 2015. 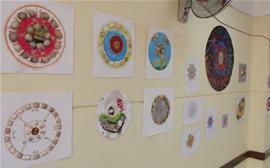 The workshop was held in the Abo Baker El-Sedik School. Forty eight students and six teachers participated in the workshop. Within the framework of the program Support to Cultural Diversity and Creativity in Egypt , the Bibliotheca Alexandrina organized the fourth workshop under the theme of “Arts in the Classroom” in Aswan, in the period between the 28th to the 31st of January, 2015. 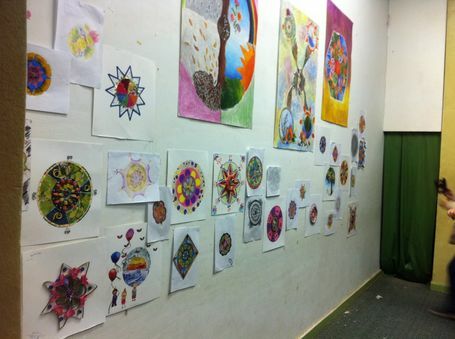 The workshop was held in the Taha Hessein School. Thirty-five students and eight teachers participated in the workshop. Within the framework of the program Support to Cultural Diversity and Creativity in Egypt , the Bibliotheca Alexandrina organized the third workshop under the theme of “Arts in the Classroom” in the city of Damanhur, Beheira governorate, in the period between the 22nd to the 25th of December, 2014. 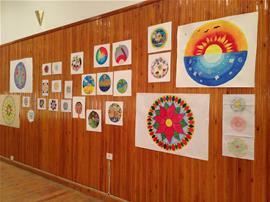 The workshop was held in the El - Gomhoria School for girls. Forty students and eighteen teacher participated in the event. 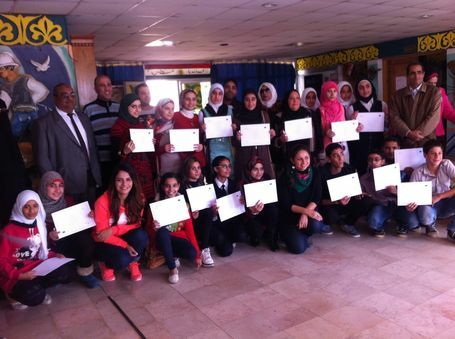 Within the framework of the program Support to Cultural Diversity and Creativity in Egypt , the Bibliotheca Alexandrina organized the second workshop under the theme of “Arts in the Classroom” in Damietta, in the period between the 8th to the 11th of December, 2014. workshop was held in the Exploration Centre and was attended by a number of schools including; Future school, Ahmed Zewail, Khaled Ibn Al-Waleed, Al Zayat, Al Kafrawy and the 25th of January. 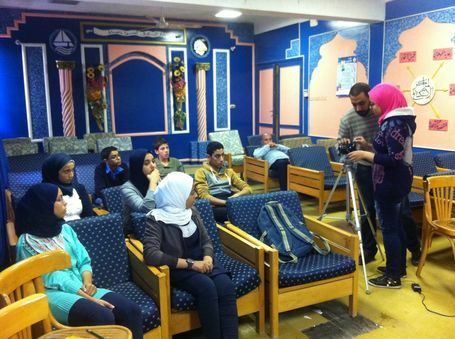 Within the framework of the program Support to Cultural Diversity and Creativity in Egypt , the Bibliotheca Alexandrina organized the first workshop under the theme of “Arts in the Classroom” in Alexandria, in the period between the 24th to the 27th of November, 2014. The workshop was held in the Exploration Centre (Al-Kasr) and was attended by a number of schools including; Al-Naggar Experimental school, Al-Fawatem Experimental School, and Al-Aorwa Al-Wothka.